Betfair Casino combines an elite pair of welcome bonuses and an easy to use site into a top notch package for New Jersey online casino players. This review will highlight everything Betfair Casino has to offer, so you can make an informed decision on whether or not you should sign up for an account. The Betfair Casino welcome bonus is a two-step bonus, that offers over $1,500 in total bonus funds to new players depending on how much their initial deposit is. Players receive a $10 registration bonus just for signing up for an account, as well as a 100% first deposit bonus good for up to $1,500. Both of these bonuses are applied to players’ accounts automatically, which is convenient. While a 20x wagering requirement, with bets weighted differently depending on what kind of game you are playing, is high, the overall strength of the welcome bonuses at Betfair Casino are strong enough to earn them top marks in our Betfair Casino review. Betfair Casino does a great job of presenting online casino games with enough variety to keep things interesting. A strong list of slots games will have players scrolling and scrolling through games that they can try out, along with a nice roster of table games that is about par for the course in the current online casino climate. What really puts Betfair Casino over the top in terms of their games offered, though, is their live casino action. Unlike most US-based online casinos, Betfair Casino does offer live casino play for its users, which adds an extra dimension of fun to playing table games online, which can feel soulless without the interaction of an actual live dealer. This nice touch gives Betfair Casino another perfect mark in this Betfair Casino review. Any Betfair Casino review should be raving about the live casino games at Betfair Casino. While offshore betting sites frequently offer live dealer games, this is far less common in the United States, which makes it commendable that Betfair Casino would put their feet into that arena. And Betfair Casino doesn’t just dip a toe into the waters of live casino gaming, they go all-in to ensure a good experience for their players. As of now, the games available for live casino players are blackjack, baccarat, and roulette, all of which are available to be played between 3PM and 3AM. While this isn’t the 24-hour per day action that other sites offer, it is the best that an American betting site is putting out there, which is great for players who enjoy going head to head with an actual, living person when playing those games. Hopefully, Betfair Casino continues to expand on this section of their site, but it’s off to a great start. Worthy of the first non-perfect rating in our Betfair Casino review is the lack of a Betfair Casino mobile app. 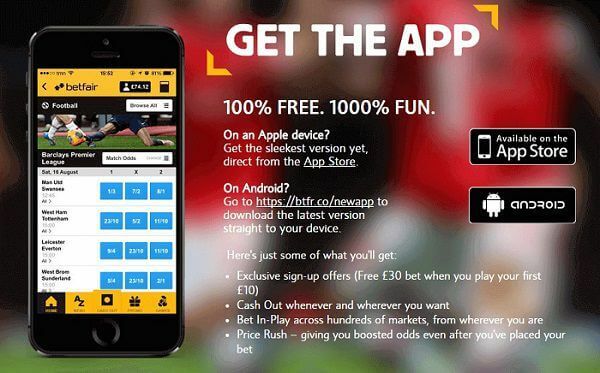 While other US-based online casinos do offer a mobile app to their players, Betfair Casino does not. They do, however, make up for this by providing players with a truly excellent mobile site that is arguable of higher quality than most betting company mobile apps on the market today. Featuring a fully responsive design, the Betfair Casino mobile site is usable on all types of mobile devices, just by accessing the site through a mobile browser such as Safari or Chrome. Once there, easy to access buttons at the top and bottom of the screen make for smooth and easy navigation to different game types or other areas of interest throughout the site. Betfair Casino players can take advantage of other promotions beyond their welcome bonuses, which we will cover in this section of our Betfair Casino review. Players can enjoy a $25 bonus every time they refer a friend to play at Betfair Casino, with their friend earning a $10 bonus in the process as well, just for signing up. Betfair Casino users can also apply to join their VIP club, which offers exclusive perks such as Atlantic City hotel stays, casino bonuses, gifts, and access to exclusive VIP events. All of this is a great way to say thank you to the players at Betfair Casino. Players can also take advantage of the Game of the Week promo, where players who wager $250 at the game of the week in a single day get a $5 bonus credited to their accounts, as an incentive to try a game that you maybe wouldn’t have otherwise. Betfair Casino’s customer service is at the top of the food chain when it comes to online casino customer service teams. They are available around the clock by both email and live chat, and can be reached by phone until well after midnight in the Eastern time zone. Among the payment options that Betfair Casino users can enjoy are credit and debit cards, e-checks, bank transfers, and more. Our handy guide below will run down the specifics. Betfair Casino combines a world class online casino with a ton of different payment options, great customer service, and a wonderful mobile site. Despite some small shortcomings, they are more than worth your time. If you choose to sign up today, you will get a welcome bonus package of up to $1500.
? Great mobile site ? Nothing! Please be sure to visit the Betfair Casino website to review the Terms of Service and all terms and conditions applicable to all aspects of online gaming on the Betfair Casino online gaming sites, including, but not limited to, Promotional Terms, Reward Plans, etc., which terms and conditions and related policies may change from time-to-time at Betfair Casino’s discretion, subject to regulatory approval. NOTE: The owner and operator of this website is not responsible for the content, Terms of Service and/or Terms and Conditions and/or policies outlined on the Betfair Casino online gaming websites and hereby disclaims any and all liability for any claims, losses, damages, costs, fees (including attorney fees), judgments alleged to have arisen, directly or indirectly, as a result of a patron or patrons’ gaming activity on such sites or arising out of a patron or patrons’ establishing an account on such sites.